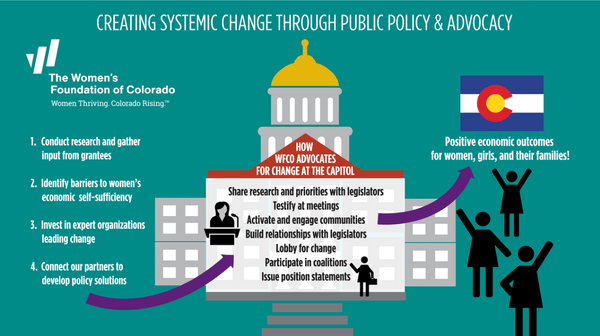 During Colorado’s 2017 legislative session, The Women’s Foundation of Colorado lent its support to 12 measures to advance and accelerate economic opportunities for Colorado women and their families. For more information on each of the bills, see below and/or download our 2017 legislative session handout. Six of the 12 bills and/or resolutions backed by WFCO passed and our policy partners passed. Someone with a federal adjusted gross income of $25,000 or less may claim a refundable state income tax credit for child care expenses. The tax credit is equal to 25 percent of eligible child care expenses that the individual incurred during the taxable year, up to a maximum amount of $500 for a single dependent or $1,000 for two or more dependents. Why does this matter? This bill will help low-income women and families who are working offset the high costs of child care, which could be up to half their incomes, for three more years. This bill will add technology skills into K-12 content standards. Why does this matter? When underserved populations have access to STEM education they are more likely to continue their studies in these fields and progress toward a career with a higher likelihood of providing economic security. Current law states it’s discriminatory and unfair labor practice for an employer to discharge, discipline, discriminate against, coerce, intimidate, threaten, or interfere with any employee or other person because the employee inquired about, disclosed, compared, or otherwise discussed the employee's wages. The bill extends the law to exempt classes of employers, including federal and state governments, thereby providing wage transparency protections to all employees in Colorado. Why does this matter? Wage transparency promotes fair and equal wages among workers and enables women in the workplace to share their salaries and/or wages. Current law treats wage theft as a trade secret and instances are not made public. Wage theft refers to a situation where an employer requires an employee to work off the clock, does not pay overtime, or commits other labor law violations. Why does this matter? When information about wage theft is made public, this transparency is more likely to ensure fair and equal wages moving forward. The bill will save costs for child care employers and workforce and expedite employment by creating a new provision that allows a child care worker who is employed in a licensed facility that is wholly owned, operated, and controlled by a common ownership group or school district to transfer the background check to another licensed facility that is owned, operated, or controlled by the same common ownership group or school district. Why does this matter? Administrative efficiencies for child care providers can help decrease costs for child care businesses and control prices for care. The Colorado General Assembly designated April 4, 2017 as Equal Pay Day in Colorado to acknowledge the persisting problem of wage disparity among various groups. Why does this matter? The gender wage gap in Colorado is not projected to close until 2057.